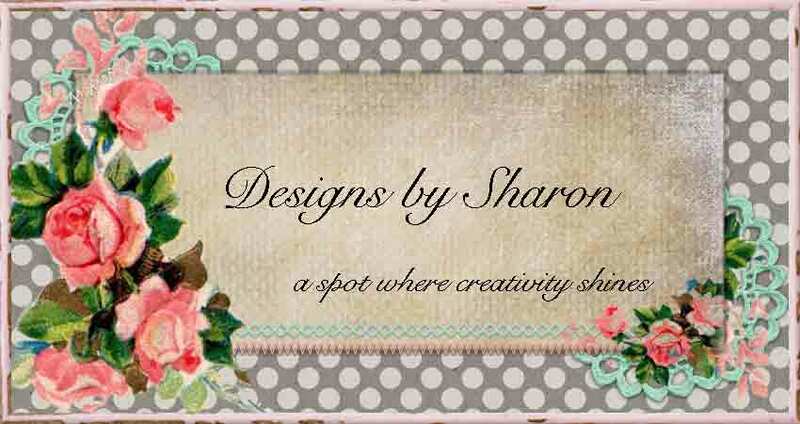 Designs by Sharon: and on that note . . . I hope you are enjoying this weekend. I also hope the weather cooperates with whatever you have planned. Me? well, the surprise baby reveal shower is today, so I'm doing those last minutes items that couldn't have been done sooner: last minute food prep, decorating cakes and cupcakes, making the last few side dishes. And then we load everything in the truck, drive into town and set it all up. I just love the whole process. and especially mingling with the guests. LOVE IT! and I hope my daughter loves what we did. I'll post photos tomorrow of our celebration. Anyways, the lovely and talented Sue from Our Creative Corner has an interesting and very do-able challenge for us this week: kraft and music. Any configuration of music and a kraft card. How wonderfully creative and I'm sure the design team will inspire you to play along with us this week. Here is my CAS (for me) card. 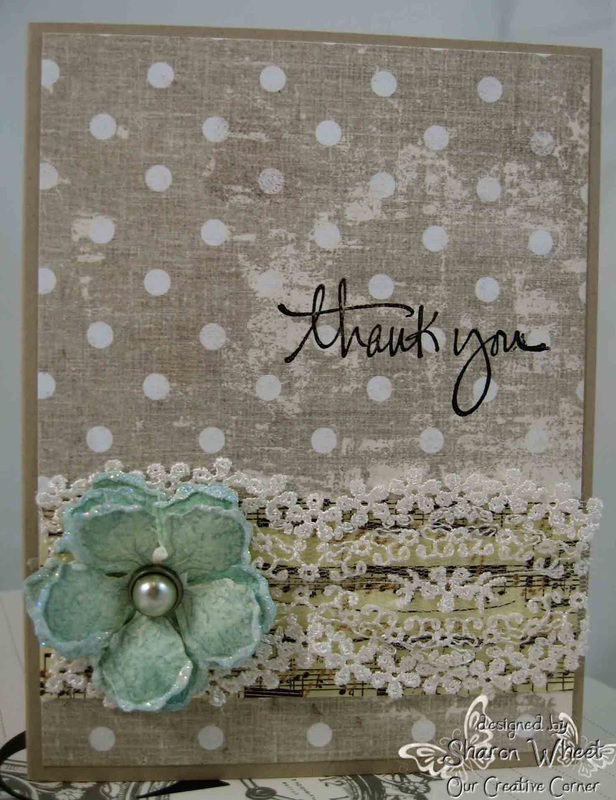 The card base is made from crumb cake card stock. The polka dot pattern paper is from Christmas. I can't remember the company or the line. sorry. But I love the worn look. The music pattern paper is from my scrap box, so I can't say for certain who made it. I added a delicate floral lace over the music paper. 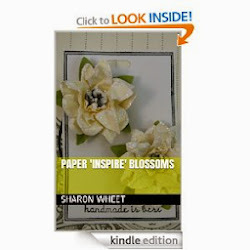 The blossom is hand-crafted from card stock, two stamps and a die. You stamp the floral image, then use a stamp positioner and stamp the veins of the blossom. Use a template you created with the die, to line everything up, and die cut. I painted the ends with some picket fence distress ink and then dunked the blossoms in dazzling diamond glitter, while the paint was still wet. I used a beautiful pearl brad from my minds eye to hold the three layers of blossoms together. I also staggered them, to give the blossom some air. I stamped the sentiment in basic black classic ink. 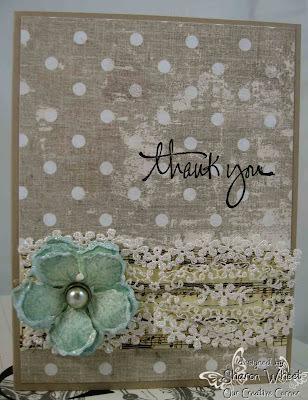 I used a hand-script stamp set from amuse studios. I just love the font of these hand script sentiment stamps. Well, I hope you found something useful here, and have decided to play along with us @ OCC. Have a great weekend, and I'll post again, soon! 'Love it to pieces!' every single element is so well placed, the design is simple but that lace... is to die for, along with your flower, there is such wonderful, wonderful movement on this card.